Do I need an opportunity? What a silly question you say. Of course I need an opportunity you’re thinking! Well is it really silly? Be honest, if you find your self in a current role that brings you fulfillment and feeds your passion you may not even want one. If you are reading this maybe you are looking for one or possibly you love your current role and organization but are looking for an opportunity for your organization to grow. How do you know when you need an opportunity? For many they always need one. They have an innate hunger that can never be curbed. Even when they are in the middle of climbing thru a Window of Opportunity they are looking for another. For most of us though we don’t aspire to be a serial“window climber” but would rather have a single opportunity to better ourselves financially, relationally, impactfulness, etc. Here are some signs to think thru to help you decide if you truly need a Window. 1. Restlessness: The restlessness spectrum can be the simple act of feeling unsettled with your mind never resting all the way to the extreme of severe anxiety. Restlessness can come from a dissatisfaction with what you or your organization has accomplished or simply knowing that there’s something more out there. Dealing with restlessness has to done in an emotionally intelligent way. We can quickly fall victim to the “grass is greener” concept we are all so familiar with if not handled correctly. Awareness is easy, deciphering this is the difficult part. 2. Capable: You know you’re capable of more. All of us have been wonderfully made. We each were created with special one-of-a-kind gifts that when left untapped leave us wanting more. For some we know what our gifts are and hope for a chance to use them. There are times that we aren’t even aware of our gifts yet but we know by how we feel that we have something inside us and want to use what we’ve been created to use. All we need is an opportunity for them to be fleshed out. 3. Life is Zipping by: We may even call this sign a bucket list sign. As time marches on for all of us we become increasingly aware that we don’t have forever. We’ve been allocated a certain amount of time to do with what we choose. There’s times we see it all going by too fast and have feelings of having missed it or the potential of missing it is on the horizon. Some create bucket lists of things that they must do. Others have a strange awareness that if an opportunity came, now is the time they would take it. For years I interviewed older retired people and asked the question, “If you had the chance to do it over again what would you do?” The most common response by far was, I would have taken more chances. By chances they mean they would have jumped thru more windows of opportunity. We see life going by and for many we can even see Windows that we’ve missed. The question is will we allow it to continue? 4. Frustrated: A total dissatisfaction with what you see. A feeling of just being tired of it all. This could be noticing something external that you are so frustrated with that you have to be part of the solution. Or it could be something internal and part of your current situation that you simply need to get away from. Whether it be a work place relationship, corporate structure, etc this feeling can be a big driver of change. There’s an old story of a boy who walks past a house everyday and on the porch is a man in his chair and his dog laying in the same spot on the porch. Every day the boy would walk by and he’d hear the dog howling. One day he stops and asks the man what’s wrong with his dog? The man tells him his dog is laying on a nail. The boy asks why the dog doesn’t move? The man simply responds, it doesn’t hurt enough yet. Does your frustration hurt enough yet? 5. You’re Not Learning: If you’re not growing, your dying. Learning is how we mentally grow. It gives life to our minds and energy to our bones. When we aren’t in an environment to learn we will slowly begin to fade. There is nothing worse than a life of silent desperation as we aren’t challenging our minds and learning to grow and bettering ourselves and the talents we have been given. Imagine what it was like to work for someone and be making wooden wagon wheels as motorcars were starting to zip on by. I would bet there were some employees that were excited to learn how to make the new wheels being used by them but were held back by employers who wanted to keep doing the same thing. Not having the opportunity to learn and grow can quickly cause a dissatisfaction that never goes away. 6. Physical reminders: I was an active flag-football player and loved playing in an organized league for years. It was so much fun to play a game I grew up playing since I was a young teen. One day we were playing and an opposing player ran past me and I missed grabbing his flag. One of my competitive team mates yelled across the field in frustration and flat out called me out for not diving and sacrificing my body for the team. It was at this moment that I realized I couldn’t physically compete at that level anymore. Not even with the ridiculous 3 visits a week to the chiropractor I was already doing to put me in game day shape. Seriously. Well if you have a physical “aha” moment like this as you own a business or have a job that is physically dependent, those are the moments you know you need an opportunity for something else. 7. Apathy: Lack of interest, enthusiasm, or concern. It sounds so sad doesn’t it. A life of apathy is not what we were created to live. Think back to when you were a teenager and were thinking and dreaming of your future. There is no way you aimed for a life of boredom. Waking up every morning with no energy or interest in what you’re about to do for the day. If you suffer from apathy, you need to look for and take hold of a Window of Opportunity. 8. Impact: At some point in our lives we all ask ourselves, “Am I making an impact?” You could be totally satisfied with your work and the organization you are part of but if you feel like it’s not facilitating you to make an impact it’ll stop you in your tracks. It’s a healthy desire to be focused on a life of making a positive impact on as many people as you can. Once your focus moves and zeroes in on impact, your desire for an opportunity or vehicle comes alive. Continuing on in your work life that’s “good” will will only stand in your way for moving towards a life fighting for “great”. So, did any of these 8 signs resonate with you? While some of the signs reflect a desire to get away from something such as apathy, others are signs of something to run to such as impact. You don’t need to have a dissatisfaction with your present state to have a desire for an opportunity. 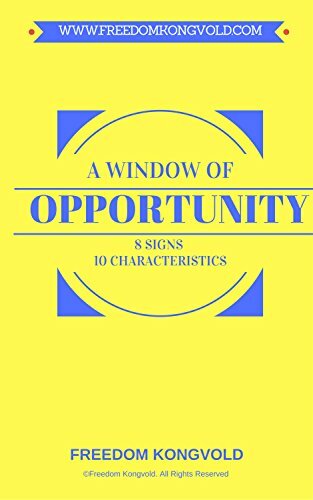 In fact, many live a life of looking and finding windows of opportunity all around them. I honestly believe that this is a talent and some are much better than others in finding them. That said, finding opportunity can be learned. Once learned it then will come down to your courage to act.